Fear to Freedom Ministries. Fear to Freedom anxiety workshop. Fear to Freedom Ministries is a non-profit, 501 (c) 3 organization that was founded and is directed by anxiety and panic author Angela Brittain. Reaching out primarily to those who struggle with fear and anxiety, Fear to Freedom Ministries was established for charitable, religious purposes. 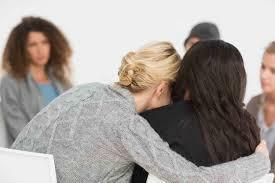 It seeks to educate, encourage and assist attendees of ministry events and visitors to our Overcomepanic.com website through messages and materials on how to overcome fear and maintain freedom from anxiety, and panic. Because anxiety disorders and fear can impact all areas of our lives, Fear to Freedom Ministries also seeks to assist the poor and disadvantaged in Northeast Ohio. Angela began helping people who struggle with fear and anxiety after overcoming her own battle with panic attacks. Her books and other resources can be purchased in the Panic Attack Online Store of this site. Consider having Angela Brittain come to your church, conference, or event to share her experience and testimony regarding fear, anxiety, and panic. She offers practical advice for dealing with the symptoms of anxiety and stress, as well as sound scriptural knowledge for Christians struggling with fear. Visit the Anxiety Author Speaker Schedule page for more information. Do worrisome and fearful thoughts dominate your thinking? Do you feel anxious most of the time? Does fear keep you from moving forward? Have you had panic attacks? If you answered yes to any of these questions, you can learn to break the stronghold of fear in order to experience a life of freedom! 2Timothy 1:7 "For God has not given us a spirit of fear, but power, love, and a sound mind." Overcoming anxiety and fear is a battle that is fought in the arena of the mind. Many of fear's symptoms affect our physical bodies, but our victory is won when we confront fear and refuse to let it keep us from doing what we need to do. The authors, ministers and speakers at the Fear to Freedom Workshops will share wisdom, revelation, and personal testimonies of their own battle and triumph over fear. They will also provide key insights to eliminating the strongholds and mindsets that can keep the anxiety and fear cycle going. If you're tired of being full of anxiety and worry, then you will want to bring the Fear to Freedom Workshop to your area. Simply fill out the form on the Anxiety Author Speaker Schedule page, and Angela's office will get back to you regarding details and availability! 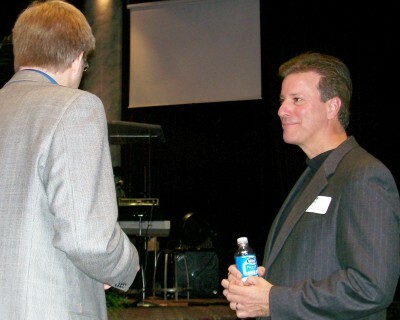 Dr. Don Lichi, psychologist and author, talks to an attendee during a break at the first Fear to Freedom Workshop. Looking at Angela, you'd never know she suffered from panic attacks. The workshop was very encouraging and I enjoyed hearing all the speakers' testimonies. I was a little nervous at first because I didn't want to have to speak or do any role playing exercises. I think folks like me might benefit from knowing how comfortable the workshop is. People were walking out the door from the workshop in tears, saying that it was life-changing,It was an excellent workshop with a wealth of sound medical and spiritual information that was presented. This workshop was instrumental in helping me realize I can overcome a phobia I've had since first grade! It was like 'in theory' I knew what to do, but you broke it down for me and now I know how to do it. I am in the Word more each day, and planning out my road to complete recovery. Speakers on this Fear to Freedom Workshop CD album include Dr. Don Lichi, psychologist at EMERGE Counseling Services , a Christian Mental Health Center in Akron, OH. Dr. Lichi is also a conference speaker, has served on the National Board of Directors for the Christian and Missionary Alliance, and is co-author of Broken Windows of the Soul . From 2001-2006 he was president and director of advancement at Chapel Hill Christian School. Dr. Lichi's magnificent message, "Healing for the Soul, Mind and Body," speaks about the medical aspects of anxiety and fear, and provides details about treatment options and how we can learn to live a balanced life. Angela K. Brittain, is an author and speaker who has personally triumphed over fear. Her resources have ministered to countless people across the globe. Angela's message, "Fear: The Fortress Without Walls," details the origin of fear, how it gets into our lives, and biblical strategies to break the strongholds from our minds. Deana Gammill, international minister and singer/song artist, ministered in song and gave her personal testimony of victory over fear. Her message, titled "Life After Personal Trauma," focused on living life after suffering personal trauma, and triumphing even when the enemy keeps pushing your "buttons." Lynnette Appling, is an anointed minister and founder of Ladies Night Out International. She is also the author of "A Kept Woman," and "The Heart of a Woman." Lynnette brought forth a powerful message on the spirit of fear in "The Brain, the Mind, and Double-mindedness." She also highlighted the tactics and operations of the enemy in this area, and how he tempts us to leave our position in Christ to come down to his level. You can order a copy of this four-CD album today. Nearly 4 hours of teaching to help you confront and overcome fear. Just visit our Panic Attack Online Store to get yours!